CrossFit Skirmish, a new Social Enterprise wins UnLtd award this Winter. CrossFit Skirmish has won an award from UnLtd, the UK’s foundation for social entrepreneurs. The funding and expert support from UnLtd will help the organisation make lasting social change in the community. CrossFit Skirmish runs both a CrossFit Box and Energy Gym at Colinton, in Edinburgh’s South Side. 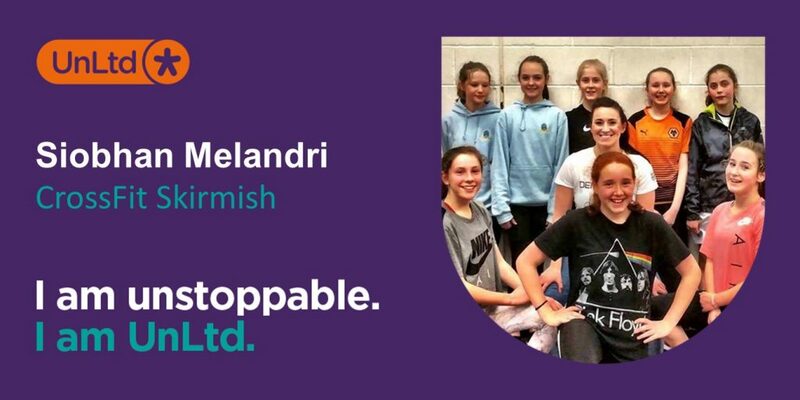 Whilst CrossFit Skirmish has always been a community gym, it recently became a social enterprise, specifically to develop work with young people. CrossFit Skirmish started to pilot young people’s CrossFit classes with young people from local sports groups and schools earlier in 2017. The results have been fantastic with the young people radically improving their overall fitness. However the work has yielded other results with improvements in confidence, academic focus and emotional strength. CrossFit Skirmish is working with Unltd to take CrossFit further into the community to use CrossFit to help address key social issues for young people – from obesity, to depression, poor body image and other behavioural issues. CrossFit Skirmish will be working on new local pilots with youth and school groups in Edinburgh, working with research teams from Scotland’s leading Universities to demonstrate both the physical and social impact that inspirational coaches and fitness programmes can have on young people who are disenfranchised within society. UnLtd is currently working hard with partners from both the public and private sectors to help deliver social impact by harnessing the huge potential of social entrepreneurs to solve society’s biggest challenges. The organisation is focused on three big impact areas; resilient communities, employability and solutions for an ageing society. More information on UnLtd’s latest funding opportunities is available online here. Picture: Angela Miller, CrossFit Skirmish Kid’s instructor training girls from Boroughmuir Thistle FC.